Lavender, Peppermint, Doublemint, Chamomile Blend, Eucalyptus, Rosemary, Honeysuckle, Lemon, Pink Grapefruit, Sweet Peppermint, Tangerine, Sweet Orange, Tea Tree, Dragon’s Blood, Wintergreen, Plumeria, and Cedar. We sell the Essential oils in a .5 oz Amber glass bottle with a dropper top. We can put in Essential oil in a 2 ounce bottle as well. Please e mail or call us about special orders on larger than .5 ounce quantities. Inaddition to Essential oils we also offer a few Fragrances due to special customer demands, they are Rose and Cucumber Melon. They are also sold in the same bottles as the Essential oils. 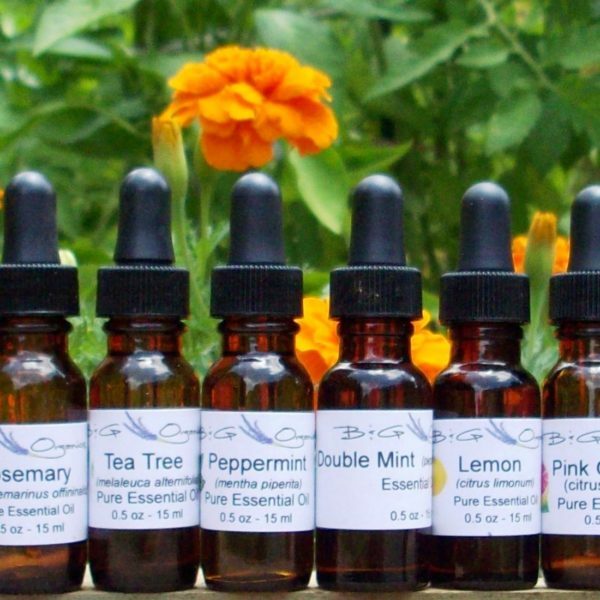 if there is an Essential oil you would like that is not on our list then please contact us and we can provide a quote on a .5 ounce or 2 ounce size. Sandy, my wife and I use Essential oils every day to help us breathe easier (Eucalyptus), freshen our house (lemon) and relax at bath time (Lavender). Lavender Essential oil: Reduces anxiety and stress and helps promotes sleep. We have customers who also spray it in their dressers on their clothes, place into their baths, and also place it on bath salts and place it in their cars, bathrooms, etc. Eucalyptus Essential oil: Eliminates headaches, soothes skin ailments, heals sore muscles and joints. I personally place a few drops into my diffuser in the bedroom and it helps me to sleep better, helping me to breathe easier. We have sold many units of Eucalyptus Essential oil to our friends who use Eucalyptus in their diffusers. Peppermint Essential oil: Peppermint Essential oil is a natural antiseptic, it has warming and cooling properties and is a natural stimulant. We use Peppermint Essential oil in our 100% Natural square vegetable soaps and many users have told me that the soap prevents them from getting rashes when shaving their upper legs. Lemon Essential oil: Lemon Essential oil is a natural antiseptic, has great cleaning properties and enhances concentration. I have several customers who use with water to make a natural cleaning solution. I have other customers who mix it with water and spray on their sheets., clothes, etc. and others who use it to make their own laundry detergent. We use it at home as a whole house scent, really leaves a clean scent. Pink Grapefruit Essential oil: Pink Grapefruit Essential oil is known to ease muscle fatigue, is a natural toner and relieves depression. We use this Essential oil in our Pink Grapefruit 100% Natural Vegetable square soap. Tea Tree Essential oil: Tea Tree Essential oil is a natural antiseptic, helps with treating acne and also helps to treat athlete’s feet. Because of its antiseptic properties we include this essential oil in our Sports Balm and Tattoo Balm formulas. Sweet Orange Essential oil: Sweet Orange Essential oil has anti inflammatory, anti depressant, and aphrodisiac properties. Vanilla Essential oil: Vanilla Essential oil has antioxidant, aphrodisiac and relaxing properties. I love the way this essential oil smells, sometimes I add to a soy candle for a nice warming scent. Chamomile Essential oil: Our essential oil is a 50/50 blend of Essential oil and Fragrance. It is very expensive and has anti-inflammatory properties. It also heals skin irritations and helps treat anxieties. We use this oil in our Chamomile vegetable soap and is our best selling soap. One of our best customers for this soap is a Dermatologist and she loves the soap. It is my favorite as well. Sweet Peppermint Essential oil: Sweet Peppermint Essential oil is a blend of 75% Peppermint and 25% Vanilla. I had this special mix made because it softens the scent of Peppermint with a calmness of the Vanilla. It is an antioxidant, aphrodisiac, and a relaxing scent.